There are two particularly disturbing things about this current bleaching event. The first is its duration: It started in 2014 and “could extend well into 2017,” Mark Eakin, who directs Coral Reef Watch for the National Oceanic and Atmospheric Administration, told me. Already, this is the longest coral bleaching on record — the previous ones lasted less than a year, he says. 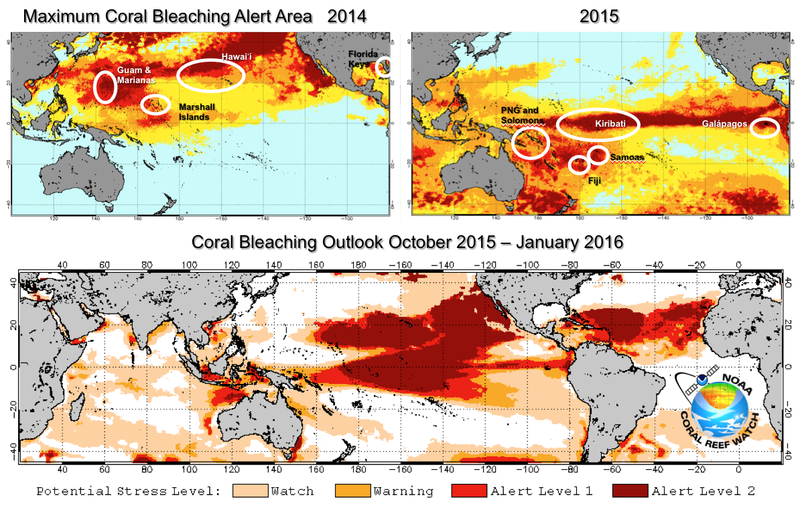 And he expects that this year, bleaching will expand and “hit more reefs” and be “more extreme” than last year. The second is how little time has passed since the previous global-scale bleaching, which took place in 2010. Once coral lose their zooxanthellae, they quickly begin to decline in health. But given time, they can recover — and many did between the last two coral bleaching events in 1998 and 2010. But this new one is only four years after the last. The shortened interval between bleachings means less recovery time and more losses, Eakin says. Warming water isn’t the only way climate change damages corals. About a quarter of the carbon dioxide emitted by burning fossil fuels ends up in the oceans, where it drives down pH levels. As a result, the oceans are currently 30 percent more acidic than they were at the dawn of the Industrial Revolution in the late 1700s. Heightened acidity impedes the growth of any species in the oceans that develop hard surfaces — everything from oysters and crabs to, yes, corals. A recent Nature study found that coral reefs grew 7 percent faster under pre-Industrial Revolution pH conditions than they do now. Slower growth makes it harder to recover from recurring insults like bleaching, Eakin says. Since the 1970s, the Caribbean region has lost 80 percent of its corals and the Great Barrier Reef along the Australian coast has declined by half. Eakin says climate models suggest the Caribbean’s corals face the biggest threat going forward, and they portend a “fairly dire future” for reefs worldwide. If current greenhouse gas emissions hold, he says, by 2050 we could see global bleaching happen every year — in short, a seascape no longer capable of supporting its vital ecosystems, ones that are are richer in biodiversity than rainforests.